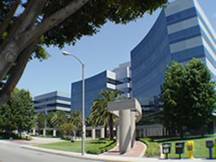 Internetworking Dynamics’ Microsoft certification training is held at the MicroTek Los Angeles learning center which is located 20 miles southwest of Downtown in the Beach Cities area, just over a mile from the LAX international airport, and two blocks from the Green Line Metro Link. Local benefits include a deli in the building, hotels within walking distance, and the ocean a couple of miles away. The 11,500 square foot room rental facility has 8 classrooms, 2 meeting rooms, a break room, and a large seating area in lobby. Classrooms are equipped with high-speed internet access through a T1 and DSL lines. Wireless (Wi-Fi) service is available for the students' use along with 4 phone stations, 2 email stations, and 6 analog port stations. MicroTek has been providing high-tech computer labs since 1991. The MicroTek computer training facility is in a 6 story, blue-gray glass building on the NorthEast corner of the lot. We are on the 5th floor. From LAX Airport take Sepulveda Blvd. South for approximately 1.5 miles to Grand Ave. and turn left. Stay on Grand Ave., pass Continental Blvd., and turn left into the parking lot. The parking entrance is behind the long blue-glass office building. The Continental Grand Plaza parking fee is $8.10 per day. The parking entrance is behind the long blue-glass office building. The Continental Grand Plaza parking fee is $8.10 per day. Flights should be booked into the LAX Airport.